I’ve noticed on the twitter hashtag for the ProBlogger Event that people are having trouble deciding which sessions to go to. Well, so was I. So I adopted a strategy that seems to have worked quite well. My main goals this year surround business blogging (for my business, Nutshell), PR/Advertising through blogging and eBook creation. I went through the session list and circled (on paper, I can be old-fashioned sometimes) the sessions that matched these topics. But there’s more than one session on at once that’s relevant. That’s a great thing! That means you’re at a conference that’s right up your alley. But how to do you choose? I’ve considered two factors: Networking and Interactivity. Who is running each session? Are these people I want to make sure I meet? Are they people who inspire me and will encourage me? Is this a topic that is easy for you to learn online, afterwards? These few questions really narrowed it down for me & I’ve got my preferred sessions marked off, with a back up one on hand – just in case rooms fill up too fast or something. 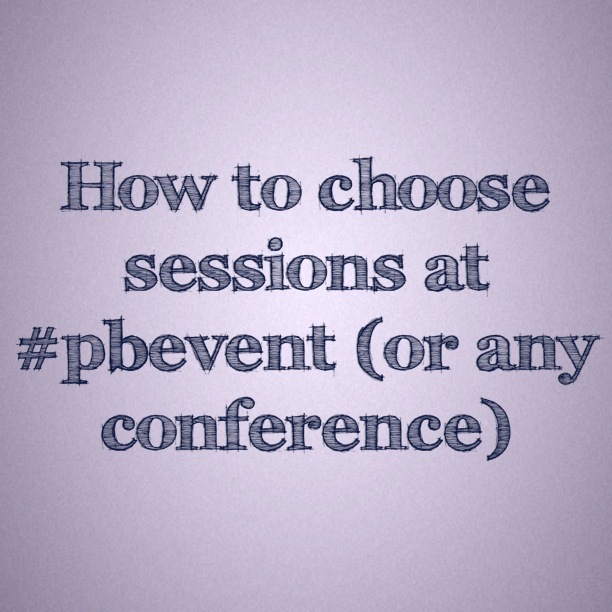 How are you choosing your sessions for PB Event? Do you have any tips on choosing to include here? I’m going to stick the printed & circled session list into my physical notebook & have a copy on my phone so I can check easily at any time. I have to keep a pretty open mind with the sessions. As a speaker, you never know what’s going to come up. It’s not so much an issue at #PBEVENT as everyone is just so awesome, but for other conferences I tend to also put a priority on speakers who a sharing their personal story rather than someone that’s likely to be leading me to a product or service they own / run etc. I find with the latter sometimes people stop short of all the juicy details we really want to hear – because that’s their IP. Ah, very true! Most conferences I’ve been to have been fairly open or uncommercial luckily. But that near-advertorial feeling puts me off of a lot of things like local small business groups (and LinkedIn). Good tips! I used the same initial criteria around matching my goals with the session content, but found there were some sessions where I wasn’t 100% into any session, so am going to play it by ear on the day. Good time to take a break and scribble down blogging ideas, if there are sessions off for you! This will be the first blogging conference I’ve ever been to so I have no idea what to expect in the sessions. That makes it harder to plan for. This is my first blogging conference, but not first blogging meetup or first conference. So I think I have a good mix of being able to guess what to attend…in theory haha. I’ll see if my plans for choosing sessions worked after the event. Hi Bec!! Sorry I don’t know how I missed replying to this! Will you be going this year? Don’t forget to apply for a virtual ticket. That way you can catch up on any of the other sessions you missed.